Made with iReliev® premium grade hydrogel, made in the USA – a proven gel featuring uncompromising adhesion, performance and longevity. With multi-layer adhesive technology, iReliev® electrode pads provide optimal bonding to the skin for a more comfortable and effective electrotherapy experience. Get Your Pack of Mini TENS Electrode Pads Today. 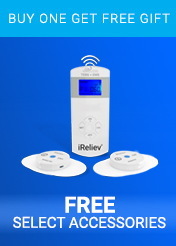 Mini TENS Electrode Pads makes it simple to replace your iReliev TENS Unit accessories. Save money and buy manufacturer direct for free shipping. iReliev® Mini TENS Electrode Pads Refill Kit with butterfly snap-style series electrode pads feature patented structural composition and hydrogel properties that provide the ultimate in therapy comfort while conducting subtle electrical impulses that help to alleviate pain and encourage soft tissue healing. These premium grade electrodes are reusable and self-adhering, providing easy application and repositioning. iReliev® Mini TENS Electrode Pads Refill Kit offers you superior design, durability, and performance with exceptional value. Mini TENS Electrode Pads Refill Kit is the perfect accessory for the ET-0303 Mini Wireless TENS. Save $$ & Buy Direct. Free Same Day Shipping. Take care of your pads and they will take care of you. With proper care, your electrodes will perform better and last longer. Please note that when electrode pads show signs of wear and tear, they should be replaced with a new set to ensure that you will continue to receive quality performance. It's also good to note that electrodes are disposable, making it even easier to replace your pads. If an electrode’s gel becomes dry, re-hydrate with droplets of water. When not in use, always reseal electrode pads in their original package and store at room temperature. The use of hot and cold packs will cause an electrode’s gel to break down over time. Optimize the life of your pads. Clean your skin with an alcohol swab or use iReliev TENS Wipes to prepare your skin for electrode placement. Always dry the area before applying the electrode pads. For the purposes of hygiene, don’t share your electrode pads with other people. When removing the electrode pads from your skin, peel from the side of the electrode pad. Be sure to properly store your electrode pads after each electrotherapy session. Make sure to stick the pads onto the transparent plastic film provided in the pack. Place the film with the electrode pads back inside the poly bag and be sure to remove any excess air. Seal bag for storage. Electrodes are intended for single person use only. Do not place around or on an open wound. Do not place electrodes near heart. 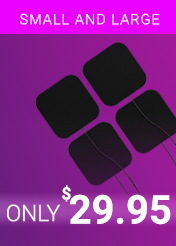 Our electrode pads make it easy to place on your areas of pain. With a flexible fabric layer, our pads are able to fit perfectly on the contours of your body, making your relief easy to find. 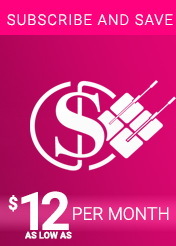 When you subscribe, you save 40% and we’ll automatically send you electrode pads right to your door at the frequency of which you choose. Free Shipping. Cancel Anytime. No Obligation. Our electrode gel was made right here in the USA. This ensures that we have the highest quality and safest materials used in our electrode pads. Premium gel creates better dispersion and conductivity. Cheaper gel comes from China or Japan. At iReliev, we do not sacrifice safety. Flexible fabric to contour better for small joints and muscles. Up to 20-30, 20 minute sessions. Not made with natural latex. Where is your hydrogel made for iReliev electrode pads? The gel is made in the USA. This premium gel is intended for optimal electrotherapy dispersion and conducts TENS and EMS therapy very well. We do not use gel made from Japan or China. What to do if pads are too sticky? If your pads are too sticky just leave them out of the zip bag to let them dry out for a while. That should solve the problem. How many times can electrode pads be used? The durability of iReliev electrodes depends entirely on the application, storage, humidity and care on the part of the person using. In the event that all conditions are perfect, we estimate 20-30 minute sessions per pad. Application: Before each electrode application, skin must be cleaned with water and soap to remove any lotions, skin oils, make-up and dead skin. Any debris on the skin will be transferred to the gel of the electrode thereby compromising the integrity of the gel’s adhesiveness. Therefore, a clean surface is the most important factor in the number of applications for an electrode. Storage: After every use, the electrode must be returned to the “ON” side of the Mylar liner, and placed in the original, resealable package to prevent loss of moisture. The electrodes should be stored at a temperature that would be comfortable for a human being, or somewhere between 41.0° and 80.6° F. with humidity at 35-50%. DO NOT: Store in freezer/refrigerator, leave in extreme heat, submerge in water, or leave outside of the package. Care: After usage, if the electrode picks up small amounts of debris you may use a drop of water on your finger to gently rub the debris off the electrode. Most important to the care of the electrode is applying it to a clean surface with each use. DO NOT: Use soap, alcohol, submerge in water, or scrub with abrasive material. The number of applications depends entirely on the proper application, storage and care by the user. The durability of the electrodes depends on the adhesiveness of the gel and its adhesiveness depends on keeping the gel clean, hydrated and free from foreign debris. Are the electrode pads disposable? Yes. When electrodes show wear and tear, no longer offer necessary tack or are no longer comfortable for the user, simply replace them with a new set. Can electrode pads be used by more than one patient? For necessary and proper hygiene, the FDA requires electrode pads to be labeled for single person use. Our electrodes are intended for single patient use only. All electrodes are disposable and should be discarded if compromised, and a fresh set used. The definition of hypoallergenic is “less likely to cause an allergic reaction than other comparable goods.” There is no scientific formula to measure or test this since everybody is different; therefore our electrode pad and the gel used is not labeled as hypoallergenic. Do iReliev electrode pads contain latex? All of our products are free of natural latex. We do not use latex of any kind in the electrodes we manufacture. 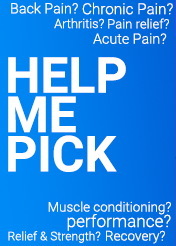 Can I use hot or cold packs? Use of hot or cold packs for long periods of time can cause adhesive separation. What TENS Unit does this fit?